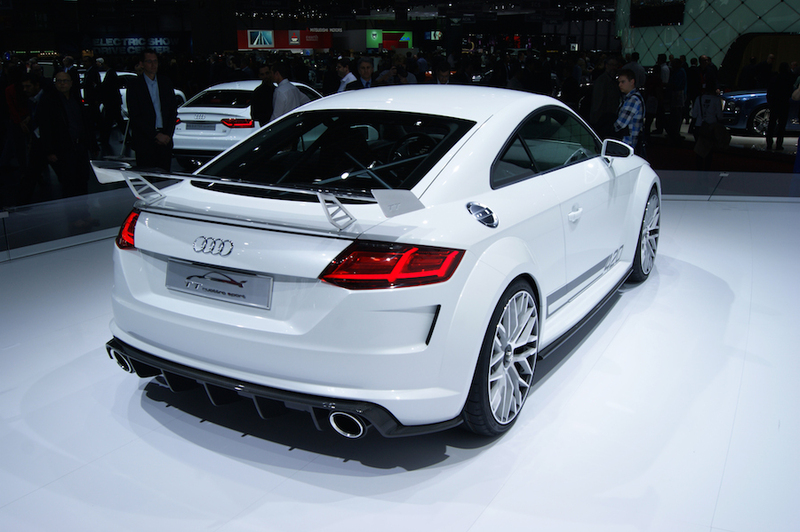 We’ve already featured the all-new Audi TT launched at this week’s Geneva Motor Show, but Ingolstadt had an extra surprise lined up for show goers; the TT quattro sport concept. Now, at EngageSportMode, we’ve become all too used to Audi making wonderful concept cars then promptly deciding not to produce them. Take the wonderful Sport quattro concept we’ve featured, twice, that has since been officially shelved. A decision made despite the fact everyone seemed to love it, and the car seemed set for a limited production run. However, the Sport quattro relied on the development of many bespoke items. This TT quattro sport concept has potential in the fact it makes use of an existing, albeit very new, car and an engine that’s been around for a number of years; the EA888 block. In this concept that’s a 2.0 litre turbocharged engine producing 420 PS (414 bhp) and 332 lb-ft of torque – outputs on a par with the V8 powered R8 supercar! 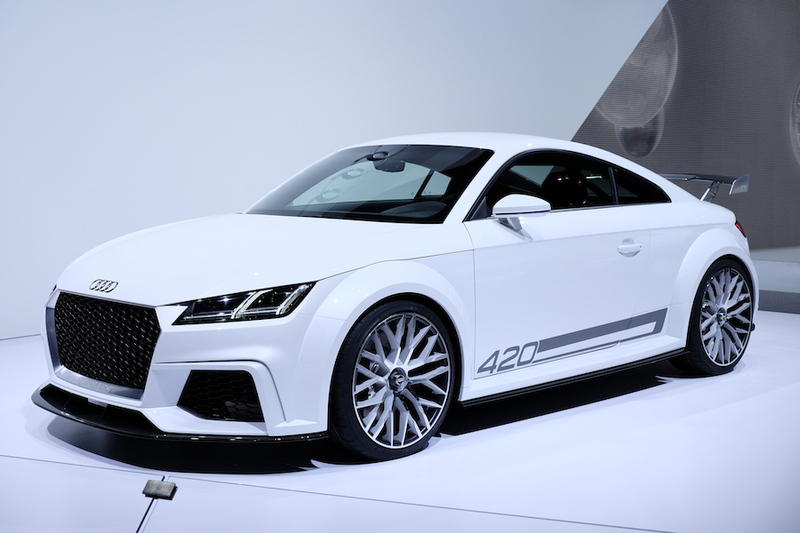 As a result this modified engine, combined with a lightened body and S tronic dual-clutch gearbox, means that the TT quattro sport concept is claimed to hit 0-62 mph in 3.7 seconds. That’s as quick as a 5.2 V10 R8 by way of reference! Top speed isn’t quoted, but we expect it to easily be more than the 155 mph electronically limited maximum of the normal TT. With that added lightness, handling is said to be enhanced over the standard car, with the option to fully deactivate the Electronic Stability Control for race track lolz. Externally there’s 20″ centre-lock alloy wheels, Crystal White paintwork, LED headlights, carbon fibre front splitter and a rather substantial fixed rear wing. At the rear fat chrome exhausts nestle into a deep carbon fibre diffuser, clearly inspired by DTM race cars. Two Alcantara-clad bucket seats (with four-point racing harnesses) dominate the interior, along with a flat-bottomed steering wheel which includes a red engine start button. The key question is, of course, will Audi actually build it? Audi’s Professor Dr. Ulrich Hackenberg was quoted as saying that the quattro sport concept was there to appeal to the “motorsport enthusiasts” amongst the company’s customer base. In the same sentence he also admitted the concept was built to show what the “new TT’s technology can do if you take it a step further” than the standard specification. Having been scorned by Audi’s decision not to build some of its most recent wonderful concept cars, we won’t hold our breath on this one. But, here’s hoping it does at least get some form of limited production as a follow up to the Mk1 TT’s quattro Sport limited edition.